Estate (private use): approx. 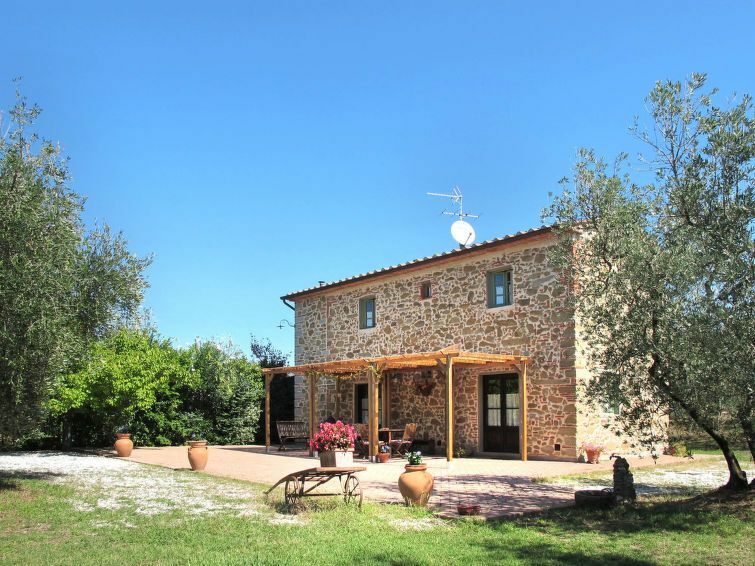 1000 m², closed plot (fence, entrance gate), meadow, gravel, flagged floor, olive trees. Garden maintenance by the owner. Outdoor facilities(private use): terrace, reserved open space (pavilion), furnishing provided, transportable barbecue. Pool (private use): 8.0 x 5.0 m, 1.20 m deep, 04.05.19-05.10.19. Pool area: tiled, deck chairs, sun loungers, sunshades, external shower. Center Vinci in approx. 5 km. Empoli in approx. 9 km. Firenze in approx. 45 km. Next shopping possibility (Vitolini) in approx. 2.7 km. Next supermarket (Vinci) in approx. 5 km. Airport Pisa-Firenze in approx. 58 km - 50 km. detached house, 4 - 6 people, 3 room/s, 2 bedroom/s, 2 bathroom/s, approx. 65 m², 2 floor/s, restored. Please note: Non-smoking house. Living room/bed room(ground floor): 1 x armchair, double sofa bed, fireplace (insert), exit to terrace. From the living room stairs to upper levels. Kitchen: open to the living room (ground floor), exit to terrace. Kitchen/ cooking equipment: 4 electric plates, microwave oven, dish-washer, refrigerator, coffee machine. Bedroom 1(floor 1): queen-size bed (1.60 m wide), air conditioning. Additional information: direct access to sanitary no 1. Bedroom 2(floor 1): 2 x single bed it is allowed to put together the beds, air conditioning. Additional information: direct access to sanitary no 2. Local service charges Electricity according to consumption approx. € 0,35/​kWh. Gas according to consumption approx. € 5/​cubic meter. Holiday resort tax. Linen/towels available. Deposit € 200 (in cash). Cot/​High chair free of charge (on order). Pet 2 animals allowed, € 4 per pet and day (please advise prior to arrival).